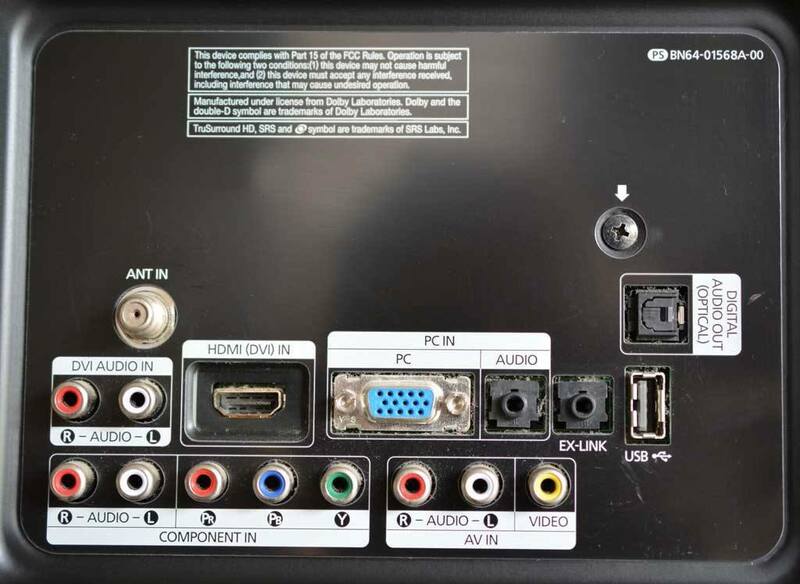 Have you ever looked on the back of your TV and wondered just what the heck all of those TV connections are for? I was lucky. Way back when I worked for Circuit City, one of the guys in the video department took his time and explained the differences between the different video ports. He showed me the same movie using different cables and connections so I could see first hand what the differences were. At the time, we used what was THE movie to show off what a TV could do: The Matrix. Yeah, I know, I’m dating myself a bit here. It was surprising to see how much difference changing the TV connections could be. But it was shocking to see how little difference the cable quality made. So how do you know which video ports to use? 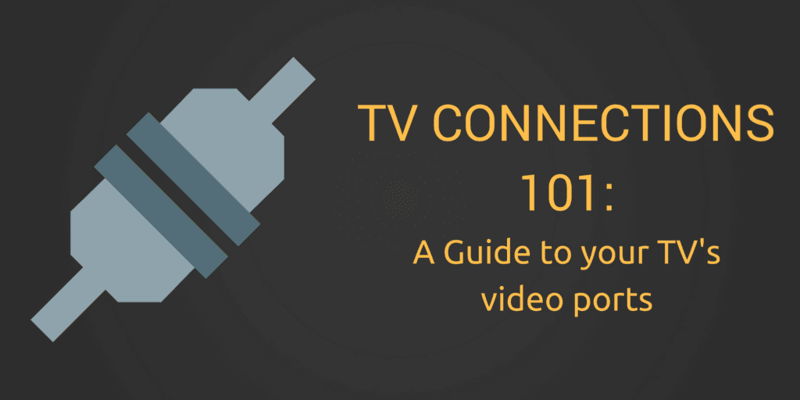 Well, since you probably don’t have your own friend in the video department to help explain them to you, let me be your guide help you figure out the TV connections you should use. For this article, I’ve used my Samsung 40″ LCD TV. It’s a few years old, but it’s got almost all of the standard video ports on the back. It’s missing an DVI input and an older S-Video port. Both of which are not commonly found on TV’s anymore. I’ll go into what each port looks like and what you should be plugging into them. We start our trip down video port lane at the very beginning. The Coaxial Input, or Coax for short, is the oldest video connection that is still in use today. The cable consists of a copper core transmitting both the audio and video parts of the signal. It has a woven weave shielding wrapped around the inner core. To give you a better idea of what this looks like, imagine a hot water pipe with a towel wrapped around it for insulation. The towel helps keep the heat from bleeding out of the cable. The copper weave does a similar job keeping your video signal from bleeding out of the coax cable and interfering with any other cables that may be nearby. Coax cables can be a bit confusing for amateur videophiles because the resolution they output depends on where they are in the chain of devices. The coax cable from your wall to the cable box will transmit a raw signal that can get HD resolution. Once it goes into your cable box (or if your TV has an integrated tuner), your TV will attempt to upscale it to the TV’s native resolution. What that means is if you are using coax from your cable-box to your TV you are not getting a true HD signal. Think of it like taking a picture and then zooming in. The picture will eventually get grainy because there’s not enough information to reproduce the picture accurately. Composite video cables are the most common type of video connection found on video devices. This cable goes by several different names such as the “RCA cable” or even the more simple “Red\White\Yellow” cable. The cable takes the basic design of the coaxial cable, which is one cable transmitting both audio and video, and splits the audio portion of the signal off the cable. The result is the Video signal is carried along the Yellow-tipped cable, while the left and right audio channels are carried along the White and Red tipped cables. Even though the RCA cable improves on the design of the Coax cable, you don’t really see that in picture quality or resolution. It is still common to see the signal degrade and turn into a blotchy checkerboard pattern along the edges of an image where colors meet. Composite cables are fine for low resolution, SD TV’s only if the people watching the TV care more about the distraction than the picture quality – i.e. kids. You don’t see S-Video cables too much anymore. They were a significant improvement over RCA cables in terms of picture quality, if not necessarily in resolution. The S-Video cable could only carry video. It needed a different connection for the audio part of the signal. It took the video signal and split it up into a color portion and a black and white portion, and put each of those signals along a separate wire. If you’ve been paying attention so far, you’ve probably started to see a trend, right? As we go up in cable quality, we’re breaking down the signal into smaller and smaller pieces so the image doesn’t degrade as much due to interference. You’ll keep seeing this trend as we go on. You won’t usually see a device with S-Video ports in the UK and Europe, due to the popularity of the SCART standard. In the US, the affordability of HD TV’s mean that popularity of S-Video cables is on the decline. 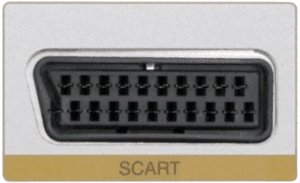 If you live in North America, you’ve probably not heard of the SCART connector. SCART, or Syndicat des Constructeurs d’Appareils Radiorécepteurs et Téléviseurs (Radio and Television Receiver Manufacturers’ Association) is a French cable connection which is standard on TV’s sold in Europe since 1980. The SCART cable was designed to simplify audio\video connections, instead of improving quality. All of the analog audio and video connections are housed in this one cable, which has a uniquely shaped connecting end. Because of that design, it is virtually impossible to incorrectly wire your device. Personally, I think this was an idea far ahead of it’s time, and you’ll see a similar design later with DVI and HDMI cables. Before you run out and try to pick up a new device with nothing but SCART connectors, you might want to take a step back. The SCART cable is an analog connection and only rated to 1080p. Sorry, no 4K connection here. The biggest kicker though, is that you’re going to need to have European stereo components in order to make this work. That’s great if you live on the other side of the Atlantic Ocean, but for those of us in Canada and the US, it just isn’t an option. So far, we’ve seen a trend. Starting with Coax cables, each new cable iteration has split apart the signal into separate wires to improve picture quality. You might say that Component Video was the pinnacle of that trend. Component video cables are usually seen in bunches of either three or five, depending on whether they include the red\white stereo audio cables as well. Side note: Don’t ask me who thought it was a good idea to include a red audio cable bundled with a red video cable. If your cables are like that, just hope they’re labeled well. 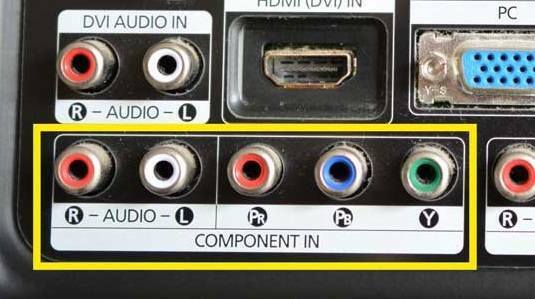 In modern TV’s, analog component video ports like you see in the picture have been largely replaced by HDMI. You’ll still find them on the back of your TV, but they’re not the best option anymore – both in quality or in cost. 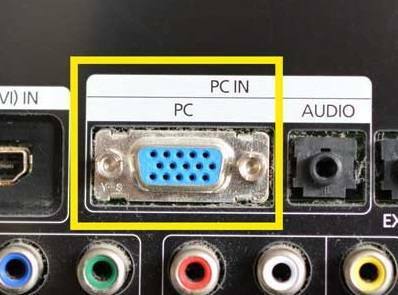 The VGA port can also be labeled as “PC” or “PC IN” as you see here. Due to the rise of HTPC’s, it is a fairly recent addition to most televisions. 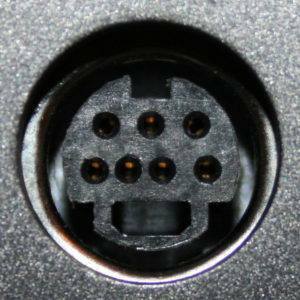 If you’ve plugged in a computer monitor anytime in the past thirty years or so, you’re probably familiar with this connection. The VGA connection operates on a similar principal to most of the other cables we’ve already discussed. It separates portions of the video signal into smaller components to improve picture quality. It only carries video signal, so you’ll need to use another port to get sound. VGA ports are one of those “specific use” ports that are only on your TV to give you more flexibility. The only device that I would connect with this port is my PC or laptop. Even then, if my computer supported it and I had enough ports available, I would recommend using an HDMI port instead. Enter the world of digital cables. 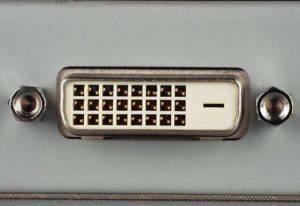 The DVI cable, or Digital Visual Interface cable, improves upon the concept of the tried-and-true VGA cable by making the shift to digital instead of analog. 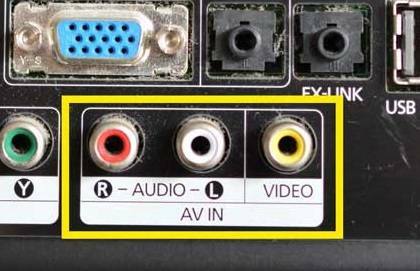 I say “instead of”, but DVI can actually support analog video signals in addition to digital, depending on the cable format. That part isn’t important for this discussion, though. 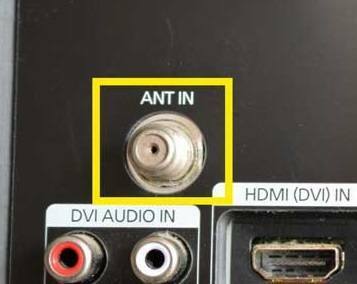 What’s important to know is that the DVI video port on the back of your TV will have the same uses and recommendations as the VGA port above. If you’ve got one, only use it for your laptop or HTPC, and only if you run out of HDMI ports. Every one of the video ports on this list was, at one time, the “next best thing.” Eventually, they were all replaced by something that was easier to hook up, or had better resolution. 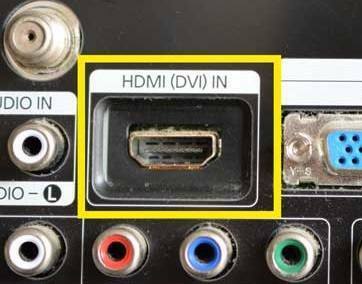 The current de-facto standard for TV connections is HDMI. The HDMI (High-Definition Multimedia Interface) specification was developed in 2002. The original spec only carried video signals and uncompressed audio, but it was designed to be flexible enough to carry high definition audio formats like Dolby Digital, DTS and Dolby TrueHD down the road. HDMI can be used for both televisions and computer monitors, making it one of the more flexible formats available today. If you have a choice of what cable to use, HDMI should be at the top of your list. 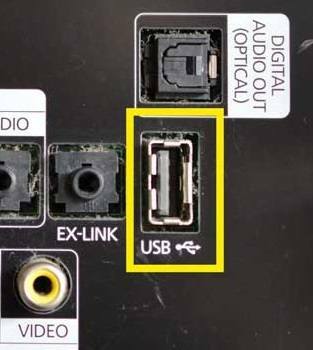 Although it’s not a video port, having a USB port on the back of your TV is incredibly useful. TV manufacturers will sell you on one main benefit to buying a TV with a USB port – being able to add a flash drive or external hard drive and show pictures directly on your TV. Some manufacturers will also use a USB port to allow for firmware updates, although you’ll still need a certified technician to install them. You can do that, sure, but hopefully by now you’ve put your pictures on either your Kodi or Plex media server. The reason why I want at least one USB port on my TV is that it lets me power peripherals like Google’s Chromecast directly from the television. That means that I won’t have to have yet another cable dangling from the back of my TV down to yet another AC adapter on my power brick. Another possibility is hooking up an 802.11 wireless adapter to your smart TV to stream installed services without hooking it up to an Ethernet cable. That won’t work on every smart TV, but it’s worth checking your manual to see if your TV has that capability. What about the EX-LINK port? I’ve never seen it before. The EX-Link port is a Samsung specific port for upgrading and servicing the TV. The cable that plugs into it is a regular mini-headphone jack on one side and an RS-232 serial cable on the other. I didn’t include it because it’s not one that consumers have access to, and it’s been replaced on newer TV’s by a dedicated USB “Service” port. A lot of very good information here for someone new to the subject. Very well written and agree with your analysis. I have used $25 HDMI gold plated connector cables and $1.99 tin plated cables from my local $.99 Only store. Can see no difference in the quality of the picture. As they say, when it comes to digital signals, the cable either works or it doesn’t. Exactly Tom. I’m glad to see someone else saying the same thing. The only reason to get a more expensive cable is if it has more shielding and there’s a lot of interference near your TV. But honestly, that’s going to happen more in stores and businesses than in your home. Otherwise, get the cheapest cable you can find. Nice job. I’m saving this to Pocket and I’m going to use it the next time that I have to explain that spaghetti mess behind someone’s TV. Haha. Thanks June. I literally laughed out loud reading your comment. Hello, I apologize if this is not the right forum but I’m pretty new with tv boxes, I have Samsung UHD TV, a 150 Mbps internet connection and just bought a 4k ott tv box but I haven’t been able to download 4k addons, the zip files are always missing or empty, plus there’s a Buck bunny video demo which is supposed to play in 4k and it would play only as 1080p, any ideas i could get would be greatly appreciated.. Excellent Job. Nicely laid out and sequenced.